A Darfur town under the control of Sudanese troops has been razed in apparent retaliation for a rebel attack on a nearby base of African peacekeepers. U.N. officials who inspected the town said that about 15,000 civilians had fled the area. International aid workers and United Nations officials dismissed claims by some rebel chiefs that 100 people had died in the North Darfur town of Haskanita. The officials said the town emptied as the army moved in last week, and troops started burning it on Wednesday. A U.N. statement issued Sunday did not say who set fire to the ethnic African town but said Sudanese government forces took control after suspected Darfur rebels attacked the nearby base of African Union peacekeepers a week ago, killing 10 peacekeepers. Haskanita, "which is currently under the control of the government, was completely burned down, except for a few buildings," said the U.N. mission to Sudan. A U.N. official who had just returned from Haskanita said it was clear that the army or its allied militias of nomad Arabs known as the janjaweed were behind it. The Arab-dominated government and the janjaweed militias are accused of regularly burning ethnic African villages as part of their counterinsurgency campaign against rebels. The official said a full army battalion of 800 troops was stationed at the entrance of the smoldering town, which was otherwise empty. "There's absolutely no doubt the army and janjaweed did it," the official said on condition of anonymity because the Sudanese government regularly expels observers who speak out against abuses. An Associated Press reporter saw Haskanita intact last Sunday when the army moved in, though plumes of smoke could already be seen rising from several nearby villages. The town had about 7,000 people, and the other thousands fled from surrounding areas, said Orla Clinton, a spokeswoman in Sudan for the U.N. Office for Coordination of Humanitarian Affairs. The rebel attack on the base came amid a government offensive that had been raging for two weeks in the same region. Some rebels have said the attack on the AU peacekeepers may have happened because some rebel groups suspected the AU of collaboration with Sudanese forces, something the AU sharply denies. U.N. spokeswoman Radhia Achouri said it would be up to the African Union to investigate who was behind the town's destruction. Sudan's government denies backing the janjaweed, who have been accused of the worst atrocities in Darfur. More than 200,000 people have died and 2.5 million have been chased from their homes since ethnic African rebels took up arms against the central government in February 2003, accusing it of discrimination. The AU said was investigating last week's attack on its base, but could not say whether it would expand the inquiry to the town's destruction. Gen. Martin Agwai, the commander of the 7,000-member AU peacekeeping force in Darfur, vowed last week that he would rebuild Haskanita's base and resend troops there soon. Large quantities of ammunition and several vehicles were looted from the base when rebels raided it. The underfunded and ill-equipped AU force has been overwhelmed in its efforts to quell Darfur's bloodshed. A joint AU-U.N. force of 26,000 peacekeepers is due to takeover on Jan. 1, also to be headed by Agwai. 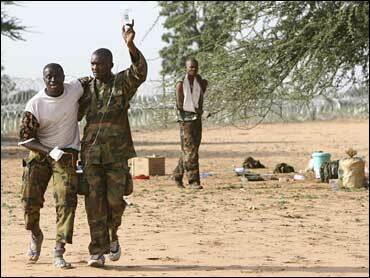 Darfur rebel groups have traded accusations on who attacked the AU base. Peacekeepers told the AP last week that they had identified the assailants as belonging to a splinter group called SLA-Unity, which has been invited to the peace talks. But Sunday, Mohammed Osman, a local chief of SLA-Unity, told the AP by satellite phone that his group had no role in the attack, blaming it on the Justice and Equality Movement. JEM leader Khalil Ibrahim dismissed that claim. "I swear on the Quran neither I nor any of my men took part," Ibrahim said, referring to Islam's holy book. One U.N. official in Darfur said he was convinced JEM led the attack, and that SLA-Unity came to the base later to share in the looting. The attack on the AU base will not delay peace talks between the government and Darfur's many rebel factions, set to start Oct. 27 in Libya, said George Ola-Davies, the spokesman for the joint U.N.-AU mediation team. He told AP the venue of the talks had been changed from the capital of Tripoli to Sirte, the town where Libyan leader Moammar Gadhafi usually lives. A key Darfur rebel chief, Abdul Wahid Elnur, has refused to attend talks if they are held in Libya. Ibrahim of the JEM, is also threatening to boycott unless the U.N. and AU can persuade the rival Sudan Liberation Army to unite its splinter factions for the negotiations. Ola-Davies said the U.N. and AU mediation has "so far not gotten any clear indication of who will be representing who."